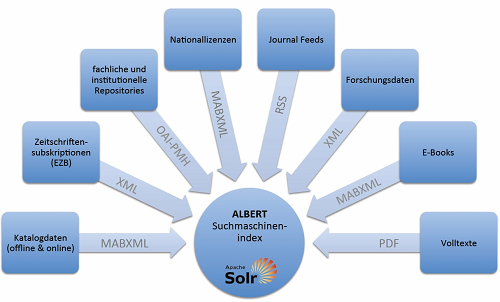 Our library search engine ALBERT is much more than a usual library catalogue. Of course you can find everything you would expect in a library catalog: including books, journals, research data and maps, print and electronic versions. But the range of material you can browse is much broader. You can find current journal articles, geoscientific articles from Open Access repositories and also older articles accessible through DFG National Licences. References from our institutional publication databases (GFZ, PIK, AWI & IASS), bibliographies and research data extend the search space.